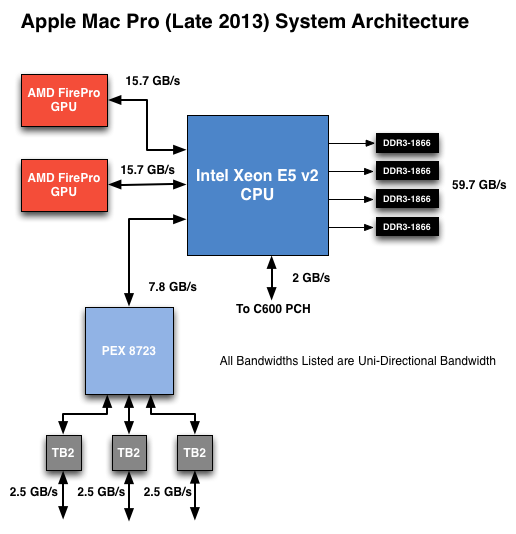 Ask anyone at Apple why they need Ivy Bridge EP vs. a conventional desktop Haswell for the Mac Pro and you’ll get two responses: core count and PCIe lanes. The first one is obvious. Haswell tops out at 4 cores today. Even though each of those cores is faster than what you get with an Ivy Bridge EP, for applications that can spawn more than 4 CPU intensive threads you’re better off taking the IPC/single threaded hit and going with an older architecture that supports more cores. The second point is a connectivity argument. You’ve got a total of 16 PCIe 3.0 lanes that branch off the CPU, and then (at most) another 8 PCIe 2.0 lanes hanging off of the Platform Controller Hub (PCH). In a dual-GPU configuration those 16 PCIe 3.0 lanes are typically divided into an 8 + 8 configuration. The 8 remaining lanes are typically more than enough for networking and extra storage controllers. Here the CPU has a total of 40 PCIe 3.0 lanes. That’s enough for each GPU in a dual-GPU setup to get a full 16 lanes, and to have another 8 left over for high-bandwidth use. 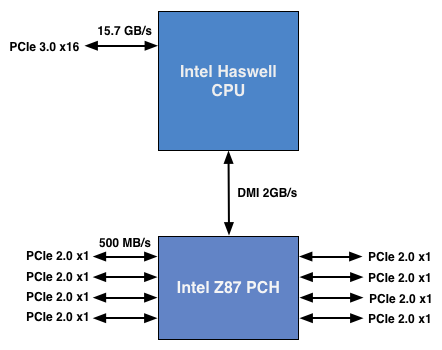 The PCH also has another 8 PCIe 2.0 lanes, just like in the conventional desktop case. Here each Gigabit Ethernet port gets a dedicated PCIe 2.0 x1 lane, the same goes for the 802.11ac controller. 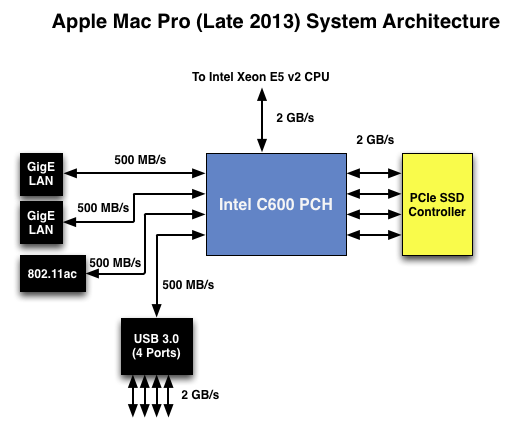 All Mac Pros ship with a PCIe x4 SSD, and those four lanes also come off the PCH. That leaves a single PCIe lane unaccounted for in the Mac Pro. 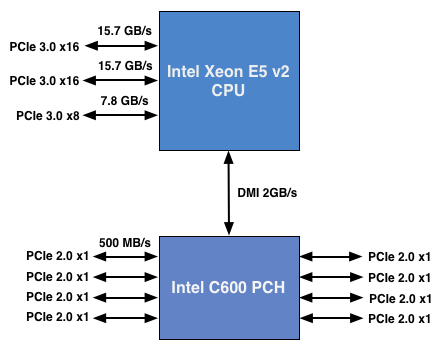 Here we really get to see how much of a mess Intel’s workstation chipset lineup is: the C600/X79 PCH doesn’t natively support USB 3.0. That’s right, it’s nearly 2014 and Intel is shipping a flagship platform without USB 3.0 support. The 8th PCIe lane off of the PCH is used by a Fresco Logic USB 3.0 controller. I believe it’s the FL1100, which is a PCIe 2.0 to 4-port USB 3.0 controller. A single PCIe 2.0 lane offers a maximum of 500MB/s of bandwidth in either direction (1GB/s aggregate), which is enough for the real world max transfer rates over USB 3.0. Do keep this limitation in mind if you’re thinking about populating all four USB 3.0 ports with high-speed storage with the intent of building a low-cost Thunderbolt alternative. You’ll be bound by the performance of a single PCIe 2.0 lane. Of the 40 PCIe 3.0 lanes, 32 are already occupied by the two AMD FirePro GPUs. Having a full x16 interface to the GPUs isn’t really necessary for gaming performance, but if you want to treat each GPU as a first class citizen then this is the way to go. That leaves us with 8 PCIe 3.0 lanes left. The Mac Pro has a total of six Thunderbolt 2 ports, each pair is driven by a single Thunderbolt 2 controller. Each Thunderbolt 2 controller accepts four PCIe 2.0 lanes as an input and delivers that bandwidth to any Thunderbolt devices downstream. If you do the math you’ll see we have a bit of a problem: 3 TB2 controllers x 4 PCIe 2.0 lanes per controller = 12 PCIe 2.0 lanes, but we only have 8 lanes left to allocate in the system. I assumed there had to be a PCIe switch sharing the 8 PCIe input lanes among the Thunderbolt 2 controllers, but I needed proof. Our Senior GPU Editor, Ryan Smith, did some digging into the Mac Pro’s enumerated PCIe devices and discovered a very familiar vendor id: 10B5, the id used by PLX Technology. PLX is a well known PCIe bridge/switch manufacturer. The part used in the Mac Pro (PEX 8723) is of course not listed on PLX’s website, but it’s pretty close to another one that PLX is presently shipping: the PEX 8724. 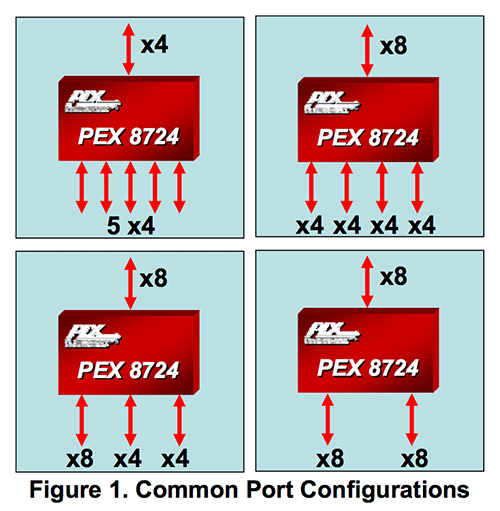 The 8724 is a 24-lane PCIe 3.0 switch. It can take 4 or 8 PCIe 3.0 lanes as an input and share that bandwidth among up to 16 (20 in the case of a x4 input) downstream PCIe lanes. Normally that would create a bandwidth bottleneck but remember that Thunderbolt 2 is still based on PCIe 2.0. The switch provides roughly 15GB/s of bandwidth to the CPU and 3 x 5GB/s of bandwidth to the Thunderbolt 2 controllers. Literally any of the 6 Thunderbolt 2 ports on the back of the Mac Pro will give you access to the 8 remaining PCIe 3.0 lanes living off of the CPU. It’s pretty impressive when you think about it, external access to a high-speed interface located on the CPU die itself. The part I haven’t quite figured out yet is how Apple handles DisplayPort functionality. All six Thunderbolt 2 ports are capable of outputting to a display, which means that there’s either a path from the FirePro to each Thunderbolt 2 controller or the PEX 8723 switch also handles DisplayPort switching. It doesn’t really matter from an end user perspective as you can plug a monitor into any port and have it work, it’s more of me wanting to know how it all works.